If you need to see something very small, but it's in another city or country, and you want to see it live, and blown up to a theater sized screen, SCA research associate professor Richard A. Weinberg, Ph.D., can help. Weinberg is the project leader of a team that will receive the Innovations in Networking Award in the Experimental and Developmental Applications category for " Digital Cinema Microscopy" from CENIC, the Corporation for Educational Network Initiatives in California, during their annual conference in March. 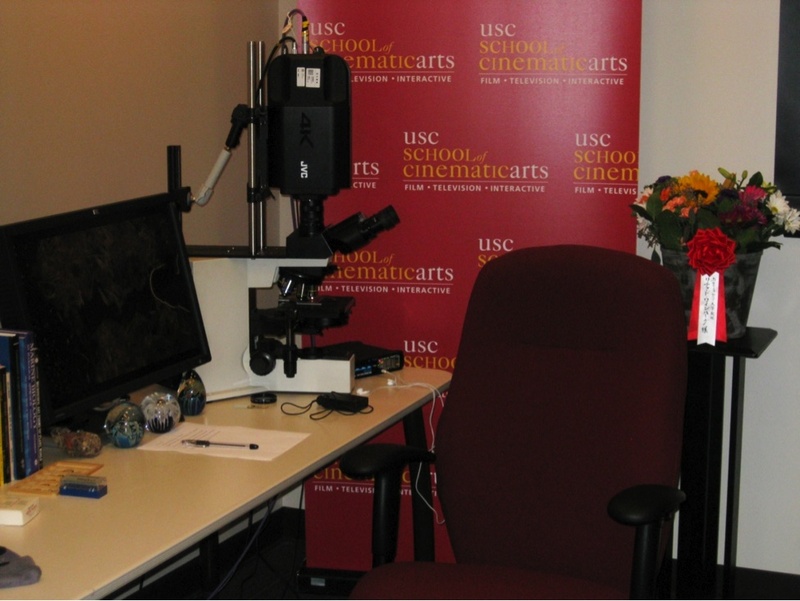 His work allows the streaming of live ultrahigh resolution microscopy from USC to locations ranging from San Diego to Tokyo. “Imagine magnifying a microorganism that is invisible to the naked eye, capturing it with a digital cinema camera through a microscope, streaming it from LA to Tokyo and projecting it there live with the quality of today's digital cinema theaters. It gives the audience the opportunity to experience the microworld as never before. The applications for this kind of work could include telemedicine, the life sciences, microbiology, marine biology, education, research and virtual micro-aquariums with tiled walls of flat panel displays,” said Weinberg. Weinberg's team included Japan-based global IT giant NTT Communications and Cinegrid, a non-profit international organization devoted to the research, development and demonstration of collaborative digital media tools. An ongoing donation by AboveNet Communications, the use of 12 single mode optical fibers connecting the School with key telecommunications buildings in downtown Los Angeles, enabled the 10-gigabit per second connection to the global high speed research networks used for the project. This is Weinberg’s second CENIC award: he was previously recognized in the Educational Applications category, for his work on developing the interactive HD streaming capabilities to a remote audience for the student film, Alternate Endings.